alaTest has collected and analyzed 131 reviews of Lenovo ThinkPad 8 (2013). The average rating for this product is 3.8/5, compared to an average rating of 4.3/5 for other products in the same category for all reviews. People are impressed by the size and portability. The performance and usability are also appreciated, whereas the apps and touch screen get critical opinions. We analyzed user and expert ratings, product age and more factors. Compared to other products in the same category the Lenovo ThinkPad 8 (2013) is awarded an overall alaScore™ of 89/100 = Very good quality. 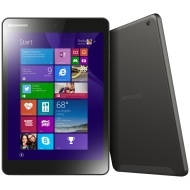 alaTest has collected and analyzed 1 user review of Lenovo ThinkPad 8 (2013) from Amazon.co.uk. The average user rating for this product is 5.0/5, compared to an average user rating of 4.3/5 for other products in the same category on Amazon.co.uk. With a high price and worst-in-class battery life, the ThinkPad 8 should be the first 8-inch Windows tablet you cross off your shopping list. Though not terrible in its own right, other small-screened slates offer more value for less money. Lenovo's ThinkPad 8 is a fantastic tablet, but it's let down by it's operating system, Windows 8.1, which lags behind the competition. Your eyes will love the crisp 1900x1200-pixel resolution on the ThinkPad 8, even with the power-consumption tradeoff. The Lenovo ThinkPad 8 is an 8-inch Windows tablet that puts your work into a handheld PC you can slip into a coat pocket. It's not a replacement for your work system, but it's an excellent companion to it. Small 8-inch form factor is truly portable. All-day battery life. QuickShot cover makes photos a snap. Professional, yet affordable. QuickShot smart cover is optional (and extra). No physical keyboard option. Few ports and connections available. The Lenovo ThinkPad 8 runs full Windows 8.1, has an excellent higher-res 8.3-inch display, 64GB of storage standard, all the basic ports you'd need, and fits into a super-slim package.